WASHINGTON — Attorney General William Barr has told the chairman of the Senate Judiciary Committee that he’s combing through special counsel Robert Mueller’s report, removing classified and other information in hopes of releasing it to Congress in April. Democrats, meanwhile, frowned at the waiting game. Rep. Elijah Cummings, one of six committee chairmen who have demanded the full report by Tuesday, said much about the path forward depends on whether the report backs up Barr’s conclusion that Mueller found no evidence that Trump colluded with the Russians to influence the 2016 elections. By Barr’s account, Mueller made no finding on whether the president obstructed justice, a question now in Congress’ hands. “The president has now an opportunity for weeks, it sounds like, to do these victory laps,” while Democrats wait on key decisions about investigating the administration, Cummings said. Challenges lie ahead for both the Republicans and the Democrats who hope to deny Trump re-election next year. Both parties are readjusting their aims and strategies in the post-probe landscape, pivoting to health care and other issues that are more important for many voters, even with Mueller’s full findings still unknown. 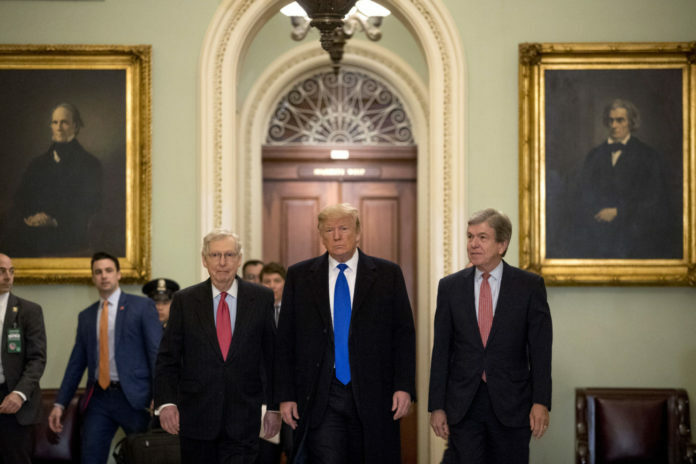 Emboldened by the end of the investigation, Trump on Tuesday strode into a high-spirited gathering of Senate Republicans, flanked by party leaders, saying the attorney general’s summary of Mueller’s report “could not have been better.” GOP senators applauded his arrival, and he celebrated what he called his “clean bill of health.” He showed an eagerness to move on, Republicans said, specifically to focus anew on repealing President Barack Obama’s signature health care law.